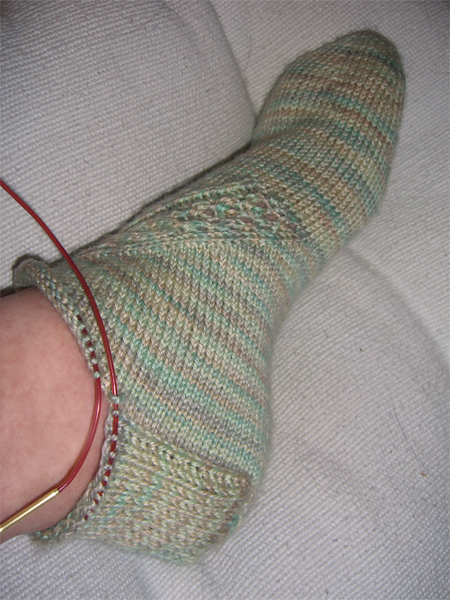 After a little knitting, a little frogging, a little more knitting, etc., I have a heel I’m happy with. 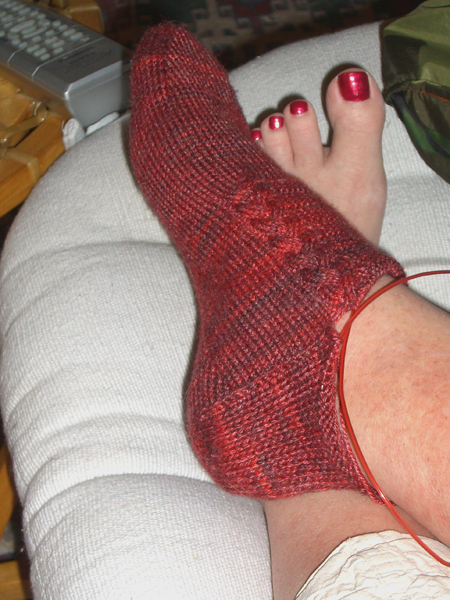 The socks still look pretty strange off the needles, but you can see that this one, at least, fits my foot pretty well. 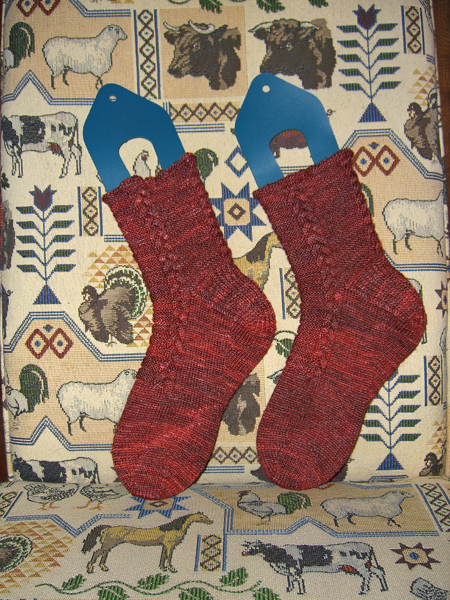 I’m assuming that the other one will, too, since the socks are the same size and my feet are at least close. But one never knows, eh? As soon as I get the heels finished, I’ll start adding in a few beads. I really didn’t want beads inside my shoes, as that didn’t sound too comfortable. So I decided to put beads only on the ankles. I tried a few bead placements yesterday. 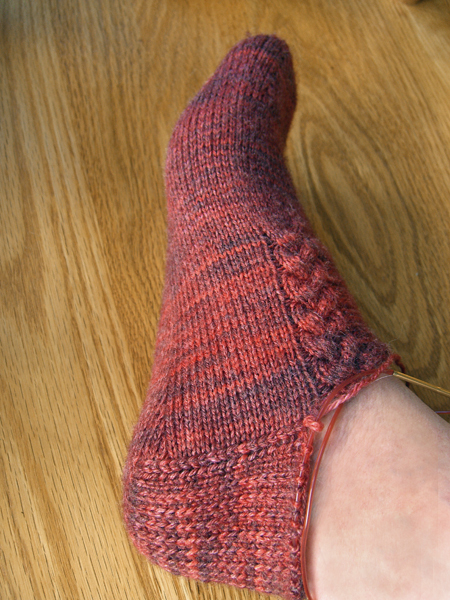 I think less is going to be more where these socks are concerned. 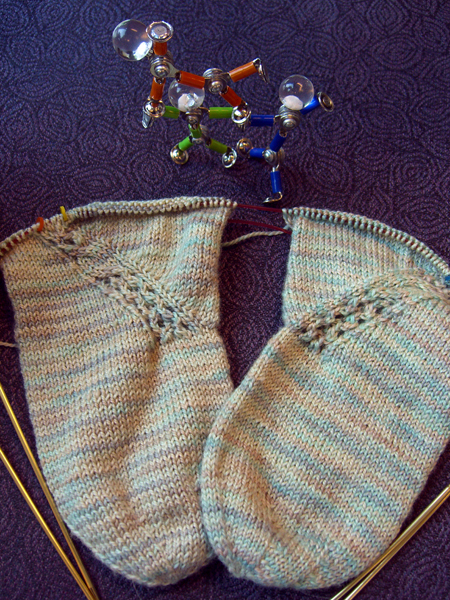 Some socks I would bead all over the place. But these already have a lot going on. 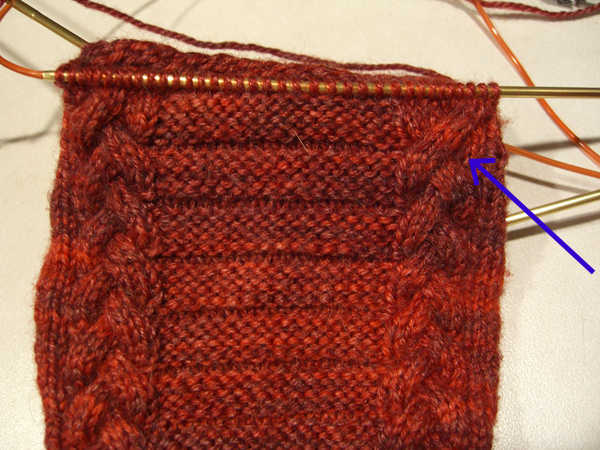 I think just a few beads worked into the lace band will be an ample sufficiency. I have some lovely square beads that will be perfect. Thanks to those of you who commented on my Hat Theory. With our little totally unscientific study, the phenomenon seems widely enough known, even to our friends in the North, that it must be fairly common. Hopefully I will not have any Hats making me late today. Today I will blame the rain. Rain has returned in spades to the Pacific Northwest. And it’s cold. 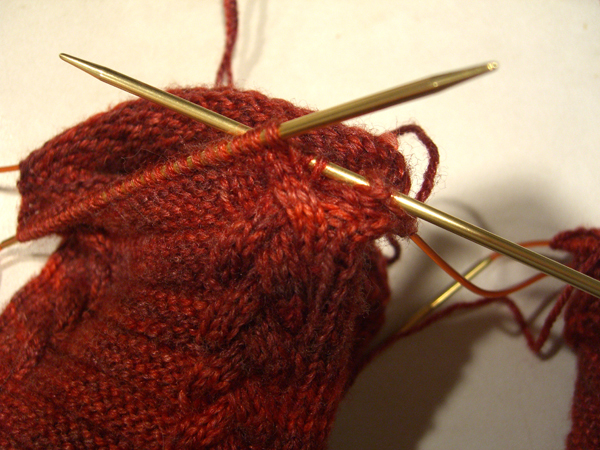 I’ve been wearing wool socks all week. Not that I mind doing that, you understand. But I’m not ready for winter. It seems like we barely had summer. My vines produced a bumper crop of grapes this year, but few of them have ripened. If it rains too hard, the remaining ones will just get knocked off. The local raccoons will appreciate that. But I will not. Speaking of local wildlife, there were some stories on the local news last week about a family of coyotes not too far from my area. Apparently the reporters are surprised to learn that coyotes can be fairly urban animals. I wasn’t surprised, having had one run through my back yard last year when the fence was down, and having listened to their music for many years. I like sharing my world. The reporters tried to drum up some OMG our pets and children may be in danger!!!!! frenzy. But fortunately most of the people they interviewed seemed very live and let live and aware that the coyotes were not much danger to we civilized animals. Lately I’ve been hearing an owl hoot at night. It’s a lonely but lovely sound in the wee hours. This is a picture-heavy post. 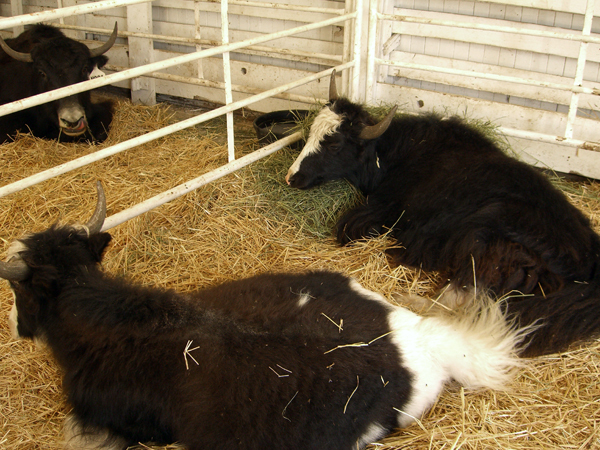 I’ve put two groups into slideshows — a few pictures from the fair are in this one, and all of the animal shots are in one at the bottom. Click on the pictures to pop them up. The slideshow controls well be available in the biggy-size. Sorry to those of you who read me in a feedreader, but this probably only works in person on the PI site. 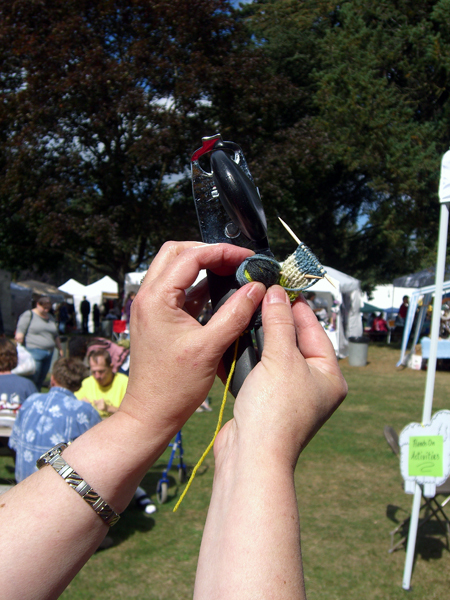 Ah….. Oregon Flock And Fiber Festival. I love this gathering. 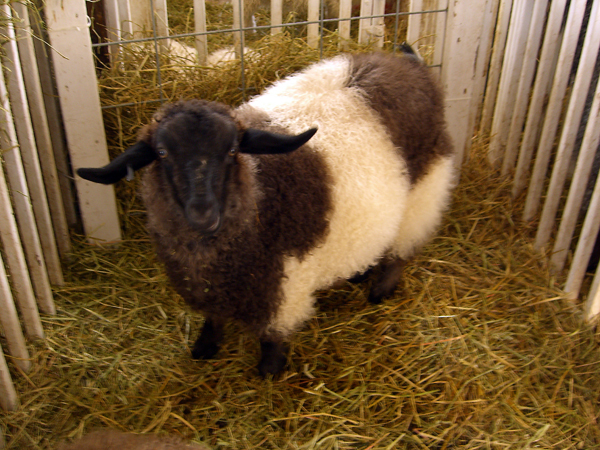 It’s not as big as Black Sheep or some of the other fiber festivals. But it’s big enough to keep a fiber addict happy for a long time. 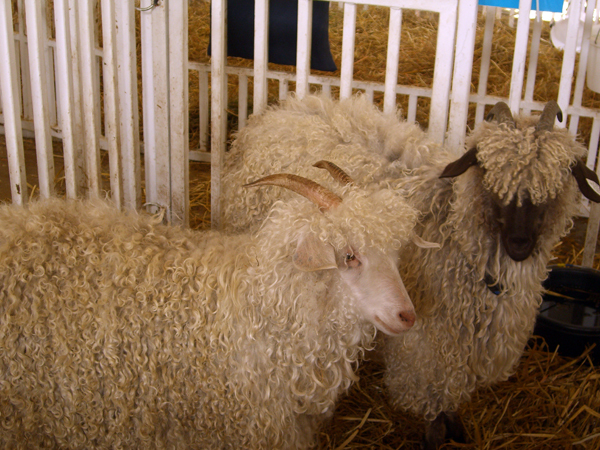 There are tons of stuff to see and animals to pet and fiber to stroke and yarn to drool over. And did I mention soap? 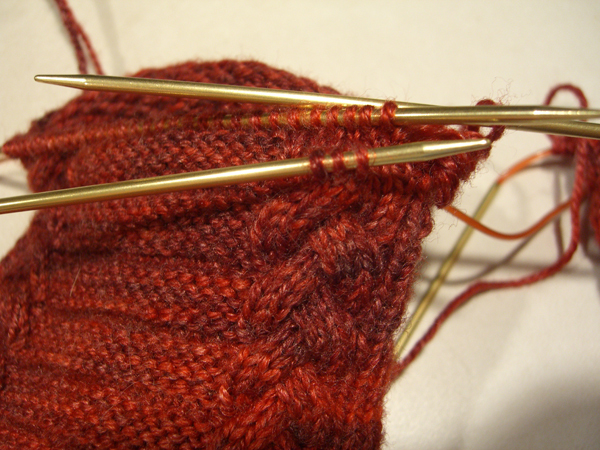 Or hand-blown glass knitting needles? Or books? And if you are of the carnivorous persuasion, lamb sandwiches and shish kabobs and stew. 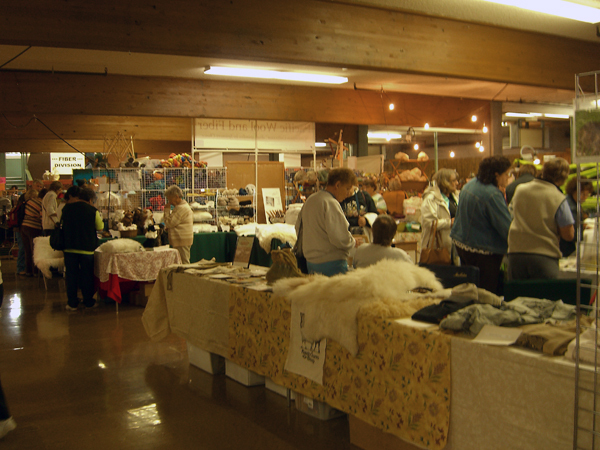 There are two large building just crammed full of booths, with the overflow in the large open area between the main buildings and the barn. Fiber judging and a finished-objects gallery are upstairs. I didn’t even get that far. 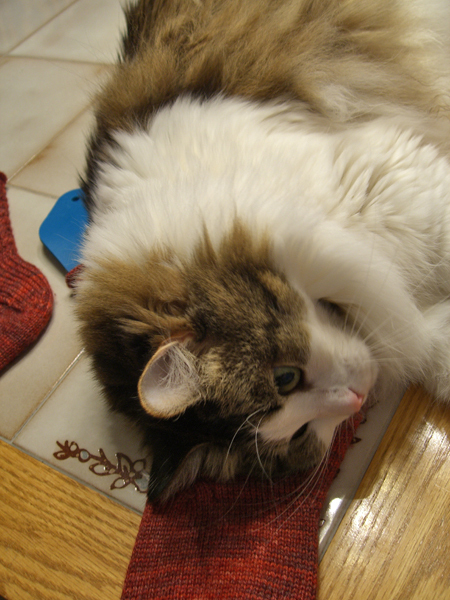 I was overwhelmed by yarn fumes. It is the overwhelmingness of the fiber fumes that I blame for falling OFFF my strict intentions for buying. I had brought only a very carefully chosen amount of cash with me, and I was on a mission. 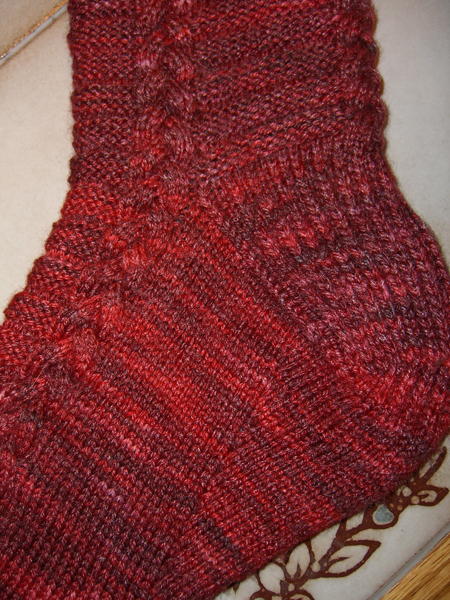 I was searching for laceweight handspun in a silk blend. And I wanted to check out a couple of the new STR colorways. 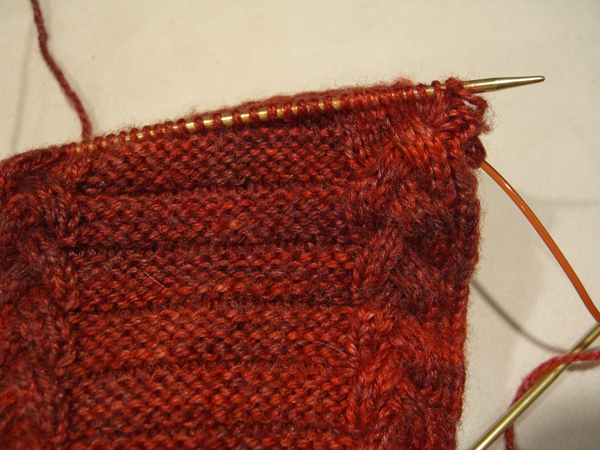 And I needed to see and probably acquire Butternut Woolens Supersock in Shelly’s new colorways. And of course I wanted to see all of my blogging and fiber friends. Yesterday I bought a new bin to keep it all in. I know, I know… but really, I’m saving for retirement! I had a wonderful, wonderful time. 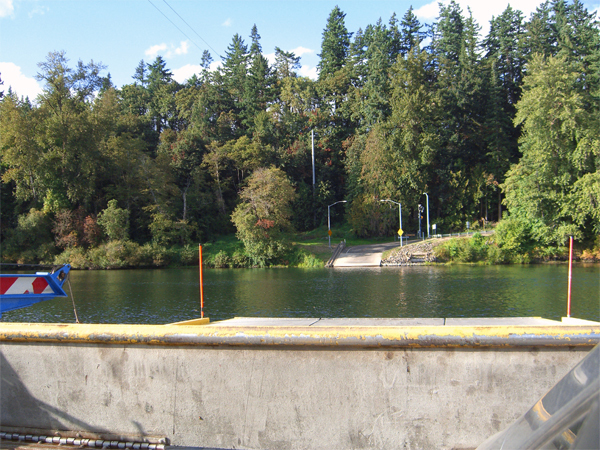 Monica rode down with me and was nice enough to agree to my little Canby Ferry jaunt that is sort of traditional with me when I go to OFFF. 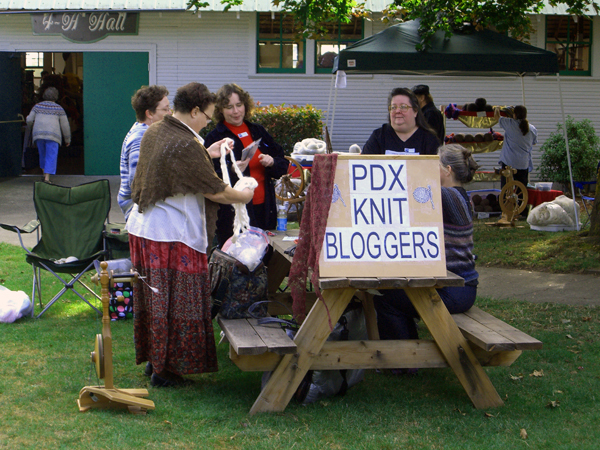 We arrived at about 8:30, to find the PDX Knitbloggers had already staked out a table. Bobbie brought our sign and placed it in a prominent location. All day people kept trying to figure out who we were and what we were doing, and were we a booth or something? Several people ventured over to ask about blogging. Many MOO cards were handed out and much fun was had. I loved having a place to go back to and stash my stuff where I knew it would be safe and watched. 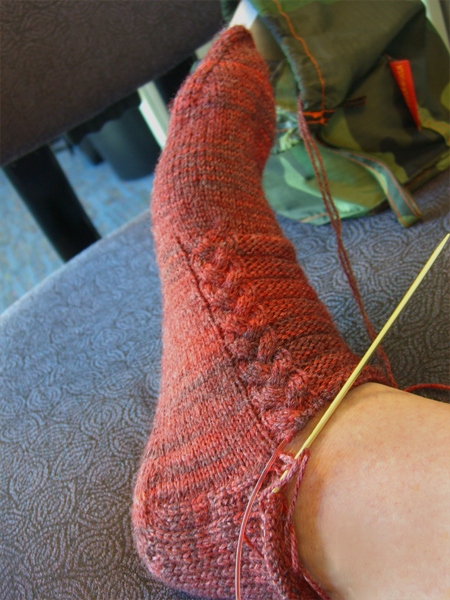 And then take a turn watching while I resting my feet and chatted. 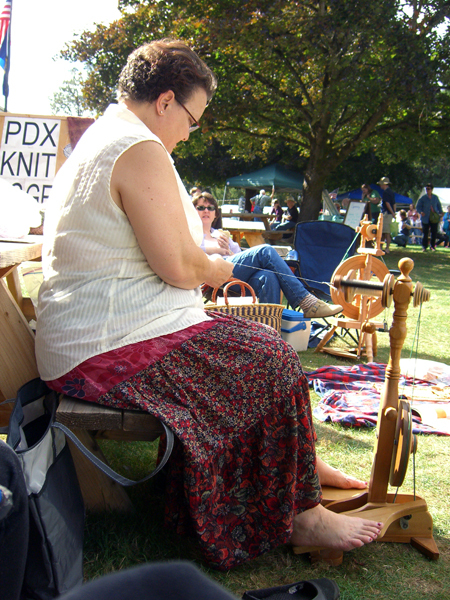 Barbara spun on her really cute little wheel, and Duffy demoed a tiny little drop spindle that spun forever and ever. And there was much other spinning going on. Which made it tough to resist that particular lure. But if I started spinning I know what would happen — next thing you know I’d have a farm with sheep and goats and bunnies. I was wonderful to meet everyone. I tried to get around to see all of the people I know, but I’m sure I missed a few. I got a wonderful hug from Shelly, who I’ve been hoping to meet for a couple of years. You must go to her website and see her lovely new colorways in subtle grays. Gorgeous. Although the weatherman had threatened us with rain, the day was perfect: warm in the sun, cool in the shade, no rain. I’ve been to OFFF in the rain, and this was much, much nicer. 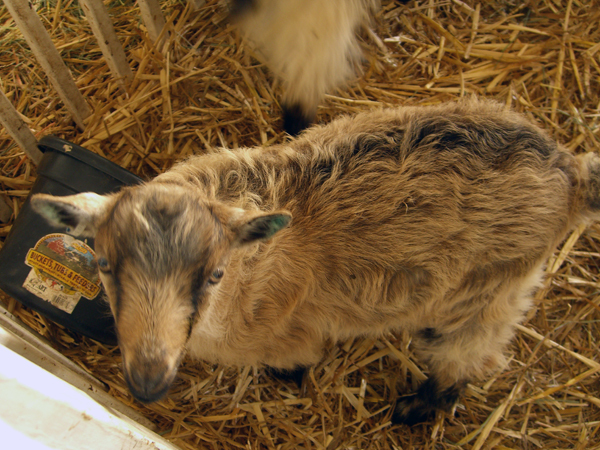 And the animals… Camels and yaks and llamas and alpacas and sheep and goats and bunnies. And probably some other that I forgot. 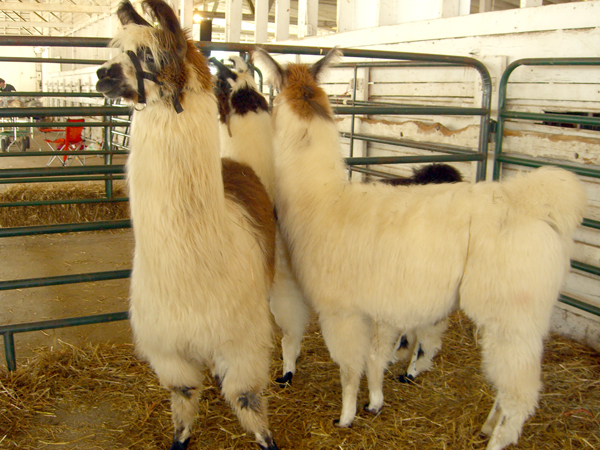 If it makes fiber on the hoof, it was mostly likely represented somewhere in the barn. 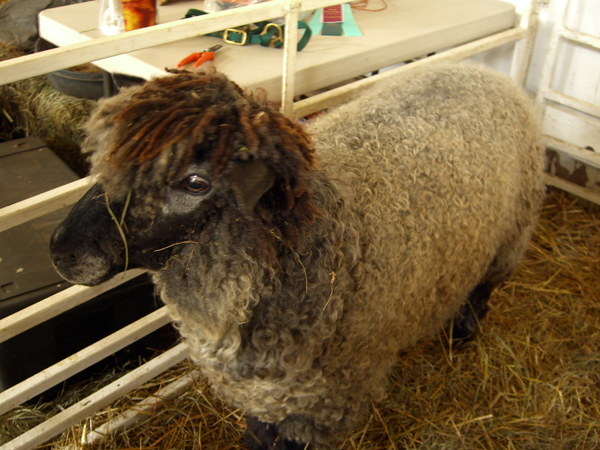 I especially liked this little sheep wearing dreds. And several of the babies who really wanted to go home with me. But, really, the cats would have been quite surprised, I think. And my yard is so small. I will resist the spinning virus. I will. Monica and Bobbie rode home with me. We took the ferry again. 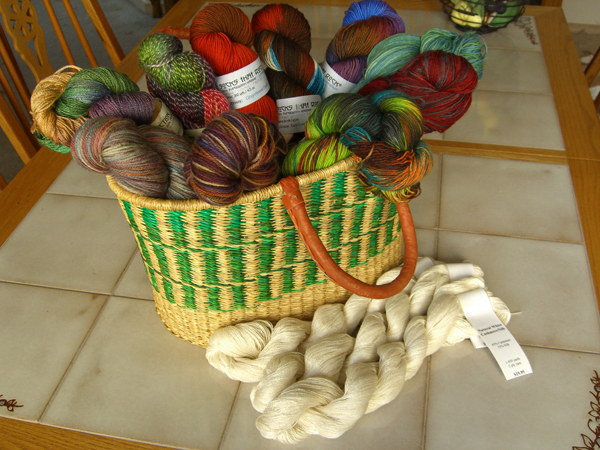 I arrived home yarn-dazed and fiber-high and happy.